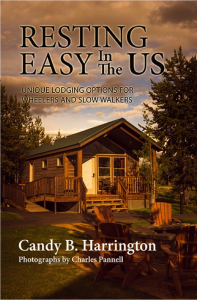 If you’re tired of staying at cookie-cutter chain hotels, then pick up a copy of Resting Easy in the US; Unique Lodging Options for Wheelers and Slow Walkers, and get ready to think outside of the box. Penned by veteran journalist and accessible travel expert Candy B. Harrington, this accessible lodging guidebook is the result of nearly two decades of in-depth research, meticulous site inspections and copious reader feedback. This handy resource includes accurate access descriptions and detailed photographs of over 90 properties across the US. From B&Bs, guest ranches and lakeside cottages, to boutique hotels, rustic cabins and deluxe yurts, variety is the key word in content. And although access varies from property to property, each one possesses a unique attribute – be it the location, the owner, the room, or maybe even the entire lodging concept. 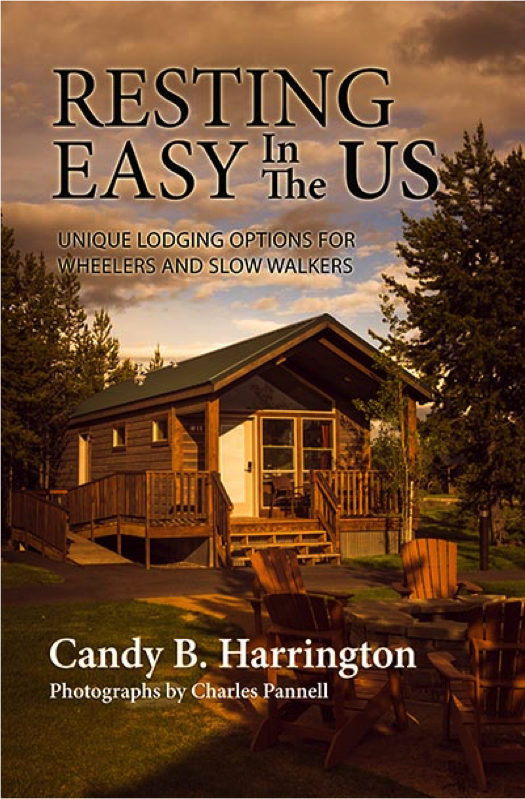 Resting Easy in the US; Unique Lodging Options for Wheelers and Slow Walkers ($15.95, 395 pages, 6 X 9 paperback, ISBN 978-0692430576; $15.95) is available here.